Gilt yields fall as investors react to US Federal Reserve delay raising interest rates due to weak inflation and doubts over Trump growth policy. 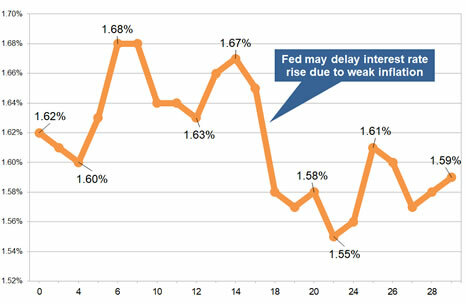 The 15-year gilt yields decreased by 3 basis points to 1.59% during the month with a sharp drop after the US Federal Reserve delays increasing interest rates due to weaker than expected inflation. In addition investors have doubts over President Donald Trump’s pro-growth policy agenda with funds moving to bonds and gilts sending yields lower. Yields are 3 basis points lower with standard providers decreasing rates by an average of -0.78% and we would expect rates may increase by 0.48% in the short term. For smoker and enhanced annuity providers increased their rates by an average of 0.02% on average and rates may decrease by -0.32% in the short term. 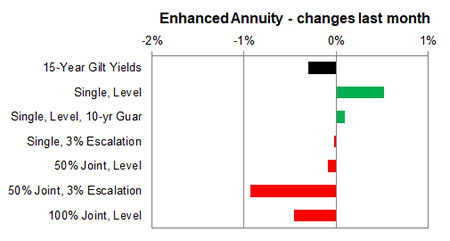 For the month of July 91% of annuity rates increased by up to 3.6% with 2% remaining unchanged and only 7% decreasing. 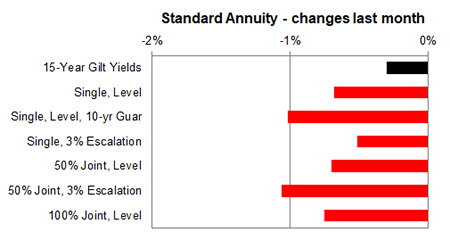 Standard annuities decreased by an average of -0.78% during the month. 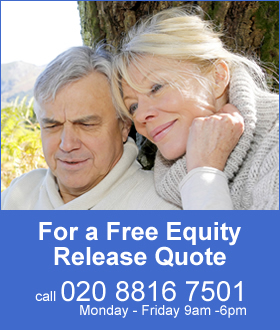 Virtually all age groups experienced decreases and in particular those aged 60 for all annuity basis with falls of up to -1.88%. For enhanced and smoker providers increased rates across the board with an average rise of only 0.02%. Joint life basis increased up to 2.2% for those aged 55 with the largest decrease of -2.3% for 100% joint life.